No matter what sort of roof you have there is a chance you will experience a roof leak under certain circumstances. Leaks can cause extensive damage resulting in the need for tens of thousands of dollars in repairs if not taken care of right away. But what causes a roof leak? There are several things that can cause enough damage to allow a roof to leak, but the biggest reason is weather. If you notice the signs of a roof leak contact a professional roofer to have the situation evaluated and repaired if necessary. As we said, most roof damage is caused by bad weather condition. However, the damage caused may not cause a visible roof leak for months, which is why it is important to have a roof inspection completed following any heavy weather event. A common cause of roof damage is heavy rain. Hard rains cause gutters to overflow allowing water to seep under the roof tiles. Water can also get under the tiles if wind blows the rain sideways. Frozen rain or hail causes very extensive damage as well, especially if the hail stones become large. One of the most common causes of a roof leak is wind carrying debris that strikes your roof. High wind can also tear shingles or tiles right off the roof, making your home very vulnerable. You should always have a professional roofer inspect your roof for potential issues following a wind storm. A less common, but still very possible problem caused by mother nature is a lightning strike. Installing a lightning rod can help prevent major damage, including fire. Following a severe weather episode conduct self visual inspection to see if you can spot any major damage to your roof. If you see something or believe there is a risk of a roof leak you should contact an expert roofer to repair the potential problem before it causes further issues. If you think you have tile roof damage in Utah contact ProTech Roofing. 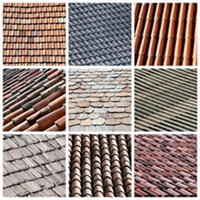 They will be able to identify and fix tile roofing in Salt Lake City, Provo, Centerville and the rest of Utah and Southern Idaho. Call Protech Roofing today at (801) 691-7720 to speak with a professional about your tile roofing installation or repair needs.